The “Newsfeed” found on MySite, is a web part with the same name, and can easily be added to other sites if you enable a hidden feature. From what I can tell, this work fine, but not perfect. The reason I don’t feel this is a perfect good solution is due to a bug within the web part. The bug is a bit hidden if you haven’t tested all the features within the the feed. This bug has not been fixed at the time of writing, and also present in Office 365. The bug I mentioned above is hidden in a popup-notification when you create a new task to follow up a social post. 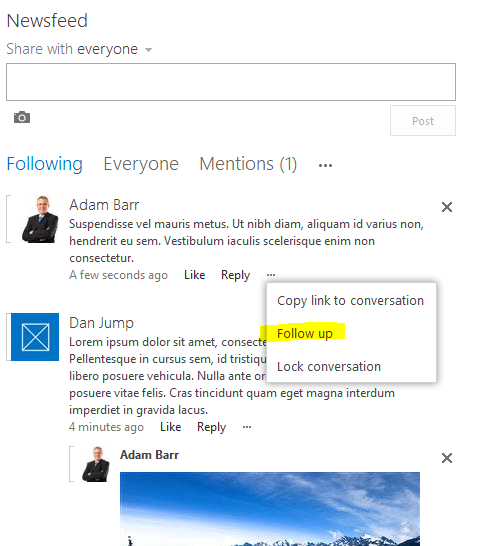 Post a new message to the feed, and open the context menu on the message by selecting “…”. Choose “Follow up”. You will end up with this spinner. From the URL, I assume that this feature was designed for a relative linking to the MySite host. The same bug can also be found in the “Sitefeed” web part. It is possible to use the standard “Newsfeed” from MySite on other sites in SharePoint. Even if the feed appears to work pretty fine, there is a bug hidden below the “Follow up” function. This combined with the feature being hidden, using the feed in other ways than Microsoft intended us to do might not be a risk free alternative. 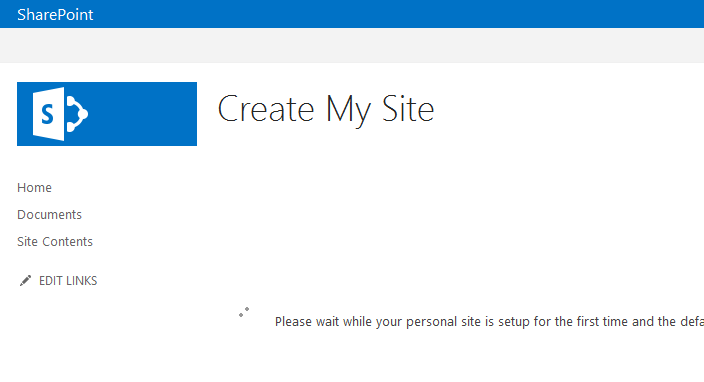 So instead of trying to re-engineer a social intranet site somewhere else, why not build the intranet on the MySite Host? I have also explored this approach, and might share more details here in the future. During a content database migration from SharePoint 2010 to 2013, we also had a requirement to move a few sites (SPWeb) to new locations. The plan was to first mount the Content Database on the SharePoint 2013 farm, create an evaluation upgrade site collection and then export the content from the upgraded site using “Export-SPWeb”. This operation failed, and after several retries it seems like this is not supported. [13.01.2014 10:26:58] FatalError: These columns don't currently have unique values. [13.01.2014 10:26:58] Progress: Export did not complete. This problem seems to occur once you have created an evaluation site within the same content database. Deleting the evaluation site does not fix the problem unfortunately. Export data with Export-SPWeb from the site, but avoid using an evaluation site. It is possible to run Export-SPWeb both when the site collection is in 2010-mode and naturally after upgrading it to 2013 as long you stay away from creating an evaluation site. If you plan to reorganize the content in the same operation as a content database migration from SharePoint 2010 to 2013, avoid using an evaluation site as it leaves your entire site collection in a state where content cannot be exported. With this experience I now always take a extra site collection backup before using creating evaluation sites (which itself is a excellent feature). A common part of a migration from SharePoint 2010 to 2013, is to include the MySite user profile and personal site collections. Both the User Profile and Managed Metadata service applications must be migrated first. After the web application has been created, and the content database(s) has been reattached, the MySite host must be upgraded to 2013. This can easily be done either from the web page or with PowerShell. All customization to the branding will be lost as the Master Page is reverted to “mysite15.master”, and you will be required to create a new Master Page based on this one to keep a custom branding. In 2013 the user will now be presented with a dialog with 1-2 options the first time they visit their MySite after the upgrade. To avoid unnecessary interruption and confusion, I think it is a good think to prepare the MySite so these choices is already set for the user from a company policy. What will it look to the end users? 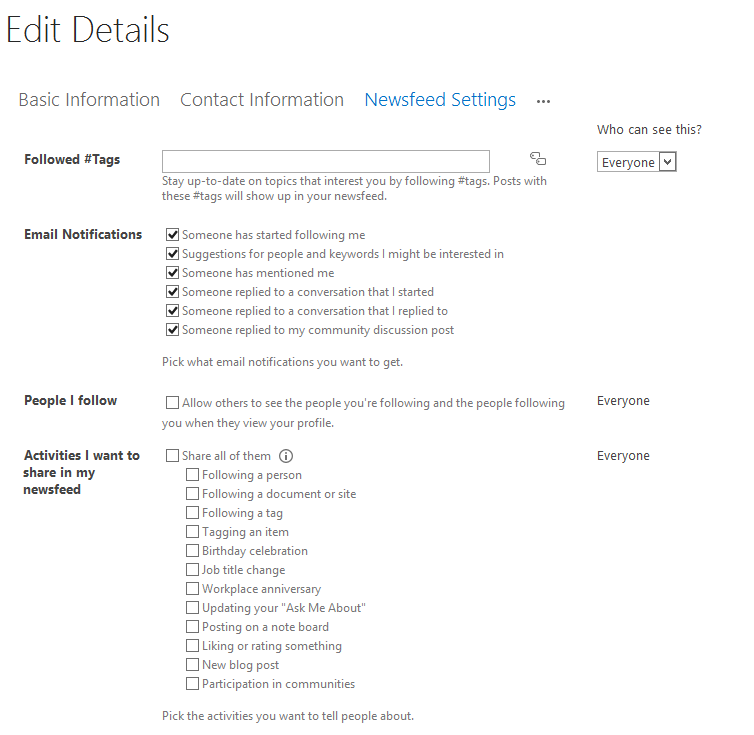 This gives the user the option to have some of the options regarding the social features in their user profile activated. It could be better to set this for all users, and give them a guide how to changes it afterwards instead. Most people won’t care, and keep the default settings. In the last option, SharePoint has detected that the user has a site collection, and that one or more document libraries exists within it. Keeping this option without being aware of what it does can end in trouble. For a personal site collection with no customization, this probably will work out fine. But if you have created personal document libraries, or even having custom solutions with their own document libraries, this must be handled differently. What happens if I choose “Ok” (as ALWAYS)? If the document library “Shared Documents” exists, it is automatically mapped to the folder “Shared with everyone”. All other document libraries are created as new folders. A few libraries are always ignored; Style Library, SiteAssets and FormServerTemplates. For testing purposes it is possible to run the initial setup multiple times as long you clean up the “Documents” library to only contain the “Shared with everyone” folder. After the files have been moved to SkyDrive, the original library is removed. SkyDrive itself is stored in the “Documents” library with the hard coded URL “/Documents”. Permissions are not copied, so if you had libraries, folder or files with unique permissions set, these must be reapplies manually after the merge. To simulate the last option in the dialog box, switch the query attribute “HasMysite” between 0 and 1. Found a hint at this blog, but it didn’t for some reason work for me: http://www.ilovesharepoint.com/2013/03/get-rid-of-mysite-lets-get-social-dialog.html. By adding the value to the AllProperties, instead of Properties bag of the SPWeb object as suggested in the article above, the dialog was suppressed. Just as a reminder when you are removing this dialog, you should make sure the default MySite configuration that is correct for your organization. For all new users, these settings are configured and managed by the service application. For existing users, a policy to enable social data can be applied with PowerShell. After migrating MySite from SharePoint 2010 to 2013, new features including Social and SkyDrive requires end-users to take action. This article discusses what these options include, and how you could set the policy up front, and suppress the dialog from appearing at all. Reduce the scope of the migration to only include the farm. Less risk and effort needed. Migrate content and solution in a later stage after the new 2013 farm has been stabilized. Keep solutions who will have an end-of-life in near future without extra effort to migrate it. Customer has no functional requirements to adopt 2013 functionality at the current time for all or parts of the solutions, and only requires a platform upgrade. How will a upgraded site collection in 2010-mode appear? When visiting a site collection after the platform has been migrated, pretty much nothing has changed (good!) for the end users, except a light pink (not nice!) bar at the top reminding us that this site should be upgraded. On the site collection upgrade page, an option to “Try a demo upgrade” is available. By default this request is put into a queue, and processed once each night. A copy of the site collection is created, and the site owner will receive an e-mail with the URL. After a fixed time of 30 days, the test site will be deleted. The reason why this is running by night, is by my best guess because the source site will throw an error while the creation of the eval site runs. So don’t be too tempted to run this timer job manually if the site is in use! The messages on the top of the screen will only be visible to the site collection administrators, so the regular users (visitors, members or owners) will not see this at all. In the “SharePoint 2013 Management Shell” run the following Powershell script. $siteUrl = "http://sp2013"; # Change this one! The option to create a evaluation site is no longer available for the site collection. The next step would be to disable the possibility for the site owners at all to perform the upgrade them self. Now both the options are disabled, and the pink bar at the top of the site is also removed. What if I want to disable this on all site collections? $webAppUrl = "http://sp2013"; # Change this one! In this article we have seen how a site collection appear to the end-users after the farm has been migrated from SharePoint 2010 to 2013, and the content databases attached back on. With a few lines of PowerShell the administrator can disable both the ability to evaluate a upgraded site as well as perform the self-service upgrade. As a SharePoint developer, I am quite often required to set up new servers for development and testing. Every time I set up a new server, I do a basic configuration before I start installing the specific software I need (SQL Server, SharePoint, Visual Studio etc.). The purpose of doing these preparations is to enable a more desktop like user experience, and remove unnecessary interruptions in the day-to-day usage. This guide is based on a Windows Server 2012 Standard GUI installation. After the initial installation and first time password setup is complete, continue in the Server Manager by setting these basic settings to get started. Select Local Server in the left side menu. This feature adds some settings and software to make the server feel more like a standard Windows 8 end-user computer. 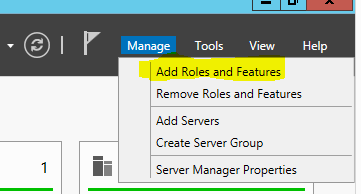 In the Server Manager select Manage and Add Roles and Features. In the wizard, select Next until you reach the Feature step. Locate User interfaces and infrastructure and expand it. Check the option for Desktop Experience. All my installation are mostly on virtual hosts, so getting Remote Desktop up and running is a much better experience than the build in console in for example Hyper-V. 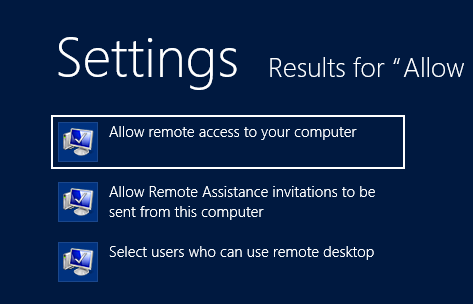 Under Settings (search for the words), select Allow remote access to your computer. 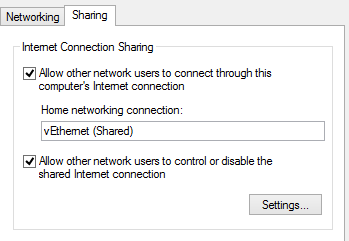 Then select Allow remote connections to the computer. Disabling these policies is not a good idea in general, but in a development environment, this is necessary to avoid hassle with Windows nagging about setting new passwords from time to time. I always use a general password for these environments, and want to avoid it being changed somewhere. Open Group Policy Management (just search for it). 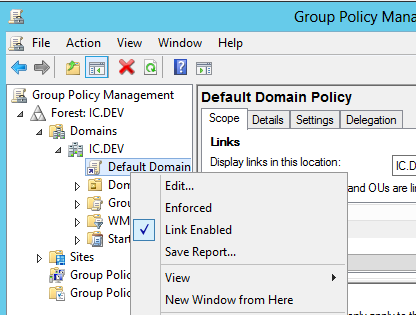 Right click on Default Domain Policy and select Edit. Open the path Computer Configuration -> Policies -> Windows Settings -> Security Settings -> Account Policies -> Password Policy. Set Enforce password history and Maximum password age to 0. Disable the Password must meet complexity requirements. 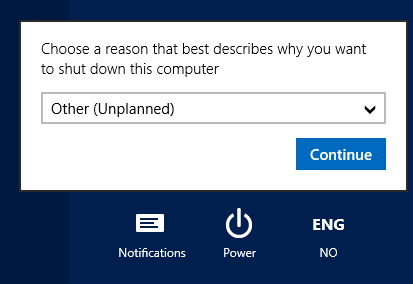 The shutdown event tracker is fine for a server, but is unnecessary on a development machine. Open the path Computer Configuration -> Policies -> Administrative Templates -> System. Select Display Shutdown Event Tracker. Select Disabled to avoid this dialogue to appear the next time you shut down the server. By default PowerShell script are disabled from being executed, and a policy setting must be set. Also just as a remined make sure that script you try to execute aren’t blocked. Check this by right clicking the file, select Settings and check if the button Unblock appear in the bottom right of the dialoge. A reboot will be necessary for this setting to take effect. In this article a step-by-step guidance for preparing a Windows Server 2012 for development and testing use were presented. This enables a better user experience when working in a server environment on the day to day basis. Just as a disclaimer, these steps reduce the general security level normally required on a server, and should only be used for development and testing purposes. Any tips that could be included in this preparation guide, are welcome! The workflow service in SharePoint 2013 Preview is no longer a part of the standard SharePoint server installation, and is provided by the Windows Workflow Manager (Azure). The service it self is a huge improvement to the product, but requires additional step as it has to be installed and configured post-installation of SharePoint Server 2013. Getting the workflow service in SharePoint 2013 Preview up and running on my development environment gave me some challenges that wasn’t well documented at the time, so I decided to list some of the error messages and steps that helped me getting it up and running properly. 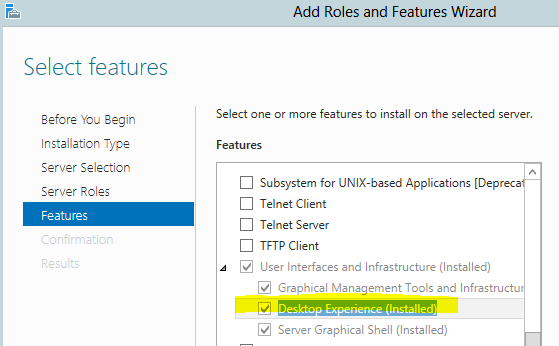 Check which regional settings are used on your setup and admin account. When I used something else than “English (United States) I got an error when accessing the configuration database. Remember to start SQL Server Browser, and keep it to start automatic. Grant the workflow service account the server roles “dbcreator” and “securityadmin” in SQL Server. Grant the workflow service account local administrator rights on the server. Run the workflow configuration wizard logged in as the workflow service account. Use a FQDN for the account in the configuration wizard (default suggestion is wrong). Run workflow configuration wizard, and remove the server from the workflow farm. Manually delete the databases created (prefixed with Wf and Sb in default installation). If registered with SharePoint, remove the service application “App Fabric Application Proxy”. It is possible to run the registration with SharePoint, Register-SPWorkflowService, with a “-Force” switch to get pass a state where it tells you it already has been registered, but still fails. This article gives some tips for resolving different errors occurring either when installing the workflow service, or when connecting it with SharePoint. DISCLAIMER: SharePoint 2013 is in preview at the time this article was written. When the product reaches RTM the content of the article may not be relevant or wrong.